Cortec’s Advanced MCI® Technology Creates Longer Service Life for Existing Overpasses and Bridges! Time and time again, bridges and overpasses ultimately begin to deteriorate from corrosion of embedded reinforcing metal. This can be the result of simple carbonation as air exposure lowers concrete pH and destroys the natural protective layer that exists on freshly embedded rebar; or it can be caused by harsh humid, salt spray, polluted, or snowy environments that persistently attack the integrity of the concrete structure. Once rust begins, it grows to several times the original size of the rebar, causing the surrounding concrete to crack and spall off the bridge, and eventually compromise the structure. Cortec’s innovative Migrating Corrosion Inhibitors (MCI® Technology) combat these problems by stalling the onset of rebar corrosion and dramatically reducing corrosion rates once started. MCIs can be applied as surface treatment or included directly in new concrete as a non-invasive admixture. In either case, MCIs are able to travel through concrete pores to protect embedded rebar below the concrete surface. The MCI® ions are attracted to the metal surfaces where they adsorb and form a monomolecular layer of protection against the ingress of oxygen, chlorides, and other corrosive contaminants. As mixed inhibitors, they provide both anodic and cathodic protection against corrosion. Powerful MCI® Technology products can be applied for greater durability at practically any stage of a bridge’s life cycle—whether construction, repair, or maintenance. However, the best results come from proactive protection before corrosion starts. Cortec® Case History 536 is a good example of such foresight in using MCI® surface treatments to protect an existing bridge from corrosion. The customer wanted to guard against future corrosion of an overpass in Osijek, Croatia, and at the same time improve the general appearance of the bridge. Two MCI® surface treatments were chosen for application and applied after the concrete was water blasted to remove dirt, oil, and grease. Once the surface dried, a solution of MCI®-2020 Powder was brushed on the overpass and allowed to dry for 24 hours. This especially powerful treatment contains MCIs that travel through pores in the densest concrete to reach and protect embedded reinforcing metal. Unlike other surface treatments that only block the ingress of contaminants, MCI®-2020 Powder forms a protective layer directly on the rebar. If the concrete overpass ever becomes cracked, the protection of MCI®-2020 Powder will still be present at the surface of the rebar. Further benefits are that it is organic, safe, environmentally friendly, and does not contain any calcium nitrite. MCI® Architectural Coating, which is available in custom colors, was applied in light gray on top of MCI®-2020 Powder to give a fresh clean look to the overpass. The topcoat contained time proven corrosion inhibiting technology and offered additional sealant protection to block out carbonation and ingress of moisture, chlorides, and contaminants. Its non-toxic, water-based, non-flammable characteristics made it safe and environmentally friendly to apply. With this dual environmentally friendly corrosion protection in place, the bridge was prepared to escape normal corrosion rate problems and experience greater durability and extended service life for the local citizens of Croatia! MCI®-2020 Powder has proven effective in the Strategic Highway Research Program (SHRP) funded by the U.S. federal government, state DOTs, and was confirmed effective in international documented field evaluation (ASTM G-109, Industrial Standards (IS) Japan and Korea, etc.). MCI -2020 Powder conforms to NSF Standard 61 – Potable water application. MCI® Architectural Coating decreases the chloride-induced corrosion rate of metal reinforcement four-fold, based on Cortec® Project ##00-285-4431. When applied to SAE 1010 carbon steel it protects 168 hours in salt spray chamber (ASTM B-117) and over 1,000 hours in humidity chamber (ASTM D-1748). When applied to aluminum, it protects over 1,000 hours in both salt spray and humidity chambers at a 2 mil DFT. MCI® Architectural Coating also conforms to ASTM D7234 – Standard Test Method for Pull-Off Adhesion Strength of Coatings on Concrete Using Portable Pull-Off Adhesion Testers. Health, safety and pollution control. Cortec formulations, using the newest chemical technology available, help alleviate your concerns in the areas of health, safety, flammability and pollution control. Multimetal protection. A full range of corrosion inhibitors is available to protect ferrous and non-ferrous metals, including formulations that protect combinations of metals. Short- and long-term protection. There’s a Cortec sollution whether you need temporary protection during in-plant processing, medium-term protection for shipment and storage or extended protection for lay-up, mothballing and field service. 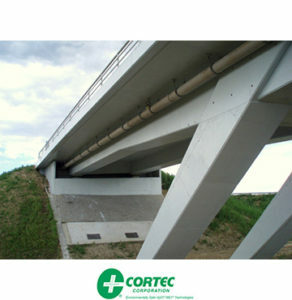 To learn more about Cortec’s innovative MCI® technology, visit www.cortecmci.com.